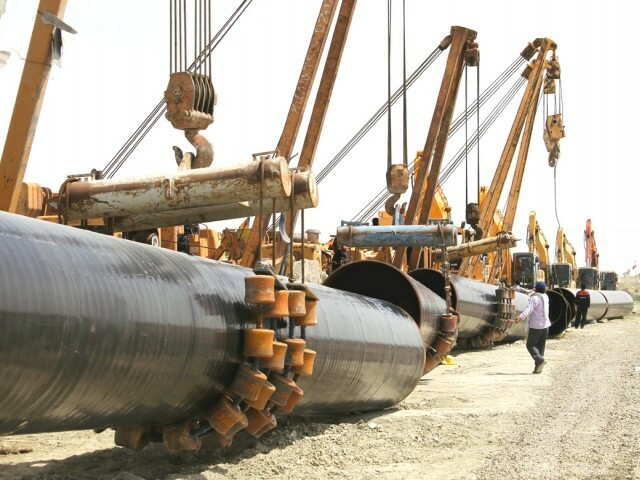 ISLAMABAD: With a deadline looming, the government on Monday told the National Assembly that it will take two years to complete Pakistan�s section of the Iran-Pakistan (IP) gas pipeline project. Minister of State for Petroleum and Natural Resources Jam Kamal Khan, while responding to questions by All Pakistan Muslim League chief Sheikh Rashid Ahmed, told the lower house of parliament that it might take another 24 months to complete the project. According to the details, when Pakistan signed the Gas Sales Purchase Agreement (GSPA) with Iran, both sides were required to complete the respective work by December 2014. The two countries also agreed to �take or pay� the contractual volume, gas supply or purchase shortfalls and termination of the contract by either side, except for the reason of �force majure�. In a written reply, the minister said the GSPA also stipulates penalties on shortfall in supply or purchase of the gas within the contractual framework (mechanism) agreed. On the termination of the contract before the term of the GSPA (25 years), the terminating party will have to pay Book Value of the other party�s pipeline, except for the reasons of the termination due to force majure. To another question, he said that as per the latest decision of the cabinet, regarding funds allocation to meet financial obligations of IP project, it had conveyed that funds collected through Gas Infrastructure Development Cess shall be utilised for the same coupled with ES $500 million financing provided by Iran. The house was informed that the pipeline will start from an onshore gas processing facility at Assaluyeh in Iran, traversing a distance of 1,150 km up to the Iran-Pakistan border, which will be built and operated by Iran. Iran has already completed a 900-kilometre portion of 56-inch diameter pipeline from Assaluyeh to Iran Shehr. The remaining 250 kilometre portion up to the Pakistan border is still under design and is expected to be completed in two years time. To another question, Jam Kamal Khan informed the house that the government is planning to accelerate the exploration of natural gas in different parts of the country and related areas will be provided special incentives to overcome the gas shortage in the country. The minister of state said that thirty-six exploration licenses, through open competitive bidding, were issued to various petroleum companies for exploration of oil and gas in the country during the last five years.